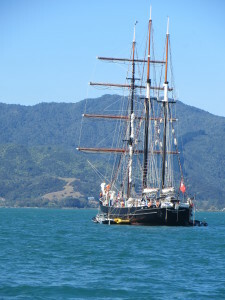 The sail training vessel, Spirit of New Zealand, at anchor in the Coromandel Harbour off Hanafords Jetty in March 2015 . Coromandel town is at the foot of the ranges. The Jetty is the landing place for the Auckland to Coromandel Ferry that runs daily during the New Zealand Summer holiday months of December and January.